The ACT SMART toolkit is a comprehensive toolkit developed for agencies that provide services to individuals with ASD. ACT SMART assists agencies successfully implement new research-based treatments. Target Agencies: Community-based agencies providing intervention services to individuals with autism spectrum disorder (ASD). Goal of ACT SMART: Assist ASD community-based agencies to identify needs, select and evaluate research-based treatments, and develop strategies to support implementation and sustained use. The ACT SMART Toolkit was developed from the Autism Model of Implementation, a framework guiding the implementation and sustainment of research-based treatments within ASD community services. ACT SMART consists of four phases, with corresponding action steps that systematically guide agency leaders and teams toward successful identification, implementation and sustained use of a new research-based treatment. Phase 1 – Identify Practice and Delivery Gaps. Agency staff complete an assessment to identify an agency’s areas of strength, opportunities for growth, and receptivity to adopt and deliver a new research-based treatment. Phase 2 – Treatment Selection and Adoption Decision. Implementation teams identify a potential research-based treatment and evaluate whether the treatment should be adopted throughout the agency. Phase 3 – Planning for Implementation. Guide implementation teams develop a treatment adaptation plan (if needed), staff training plan, and implementation plan. Phase 4 – Implementation and Sustainment. Implementation teams track and evaluate the progress of the plans developed in the previous Phase. Building capacity within agencies. Agency leaders and implementation teams receive training and ongoing facilitation for one year to support use of ACT SMART. Individualization to meet agency needs. ACT SMART allows for individualization and flexibility. It guides agencies to identify and adopt any research-based treatment that may best fit their specific needs. Additionally, agencies can individualize targeted strategies to adapt treatments, train staff, and begin using the treatment. Finally, ACT SMART allows the agency to determine who will participate in decision-making, planning, and implementation activities. Fit and Feasibility with agencies. Treatments must fit with the climate and culture of an agency to be successfully implemented and used over time. Additionally, the ease of implementing a treatment so that it can work well within the existing structure of an agency is critical for its success. ACT SMART assists agencies in evaluating the fit and feasibility of implementing a treatment in their agency to guide their adoption decision, planning and use of a treatment. Using best practices for individuals with ASD. ACT SMART was designed to support the successful use of research-based treatments by matching effective treatments with agency needs and characteristics. Comprehensive. 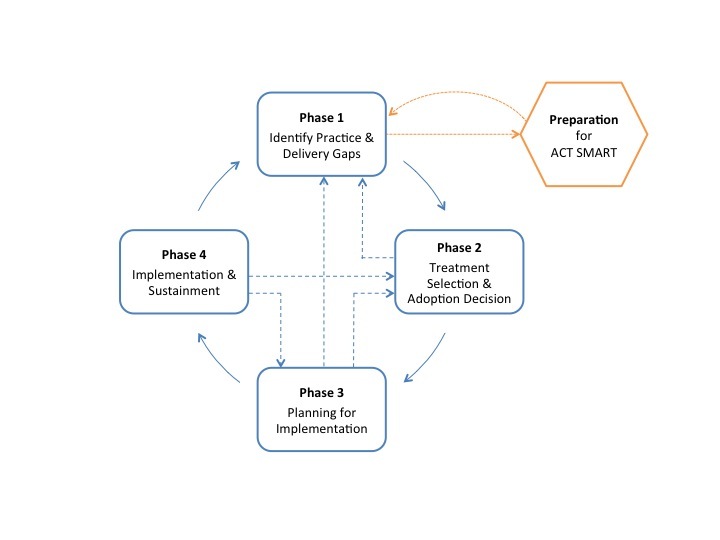 ACT SMART uses multiple strategies to guide agency leaders from evaluating agency needs through planning for treatment adaptation, staff training and implementation, and to using strategies to maintain treatment use. Systematic. ACT SMART is comprised of four phases. Each phase has steps that facilitate progress within the phase and between phases. The systematic approach provides a structure and sequence to organize activities to implement new research-based treatments efficiently and effectively. Research-based. ACT SMART is comprised of research-based phases and steps that are designed to increase the efficiency and effectiveness of agencies to implement research-based treatments. The phases comprising ACT SMART (identify practice and delivery gaps, treatment selection and adoption decision, planning for implementation, and implementation with sustainment) have been studied using rigorous scientific methods in a variety of service settings (Brownson et al., 2012).